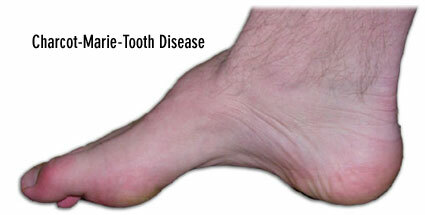 Charcot-Marie-Tooth disease is a group of progressive disorders that affect the peripheral nerves and result in problems with movement and sensation. Peripheral nerves connect the brain and spinal cord to muscles and to sensory cells that detect sensations such as touch, pain, heat, and sound. Charcot–Marie–Tooth disease (CMT) also known also as Morbus Charcot-Marie-Tooth, Charcot-Marie-Tooth neuropathy, hereditary motor and sensory neuropathy (HMSN), hereditary sensorimotor neuropathy (HSMN), or peroneal muscular atrophy. Symptoms usually begin in late childhood or early adulthood. Some people don`t experience symptoms until the early thirties. Usually, the initial symptom is foot drop early in the course of the disease. This can also cause claw toe, where the toes are always curled. Wasting of muscle tissue of the lower parts of the legs. 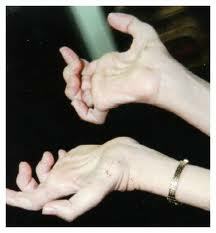 Weakness in the hands and forearms occurs in many people later in life as the disease progresses. Symptoms and progression of the disease can vary. Breathing can be affected in some; so can hear, vision, and the neck and shoulder muscles. Scoliosis is common. Hip sockets can be malformed. Gastrointestinal problems can be part of CMT, as can chew, swallowing, and speaking. A tremor can develop as muscles waste. There are many forms of CMT disease, including CMT1, CMT2, CMT3, CMT4, and CMTX. CMT can be diagnosed through symptoms, through measurement of the speed of nerve impulses (electromyography), through biopsy of the nerve, and through DNA testing. The homoeopathic treatment of this condition is aimed at treating the symptoms and repairing the damage to the nerves supplying the extremities. Medicines are used to treat the nerve damage, muscular weakness and decreased sensation of the affected extremities. Early initiation of treatment is important to prevent atrophy of muscle and permanent deformities of the feet. Regular exercise, physiotherapy and care of the feet are important aspects in the management of this condition. One can noticesymptomatic improvement within 2-3 months of treatment. To obtain maximum result treatment requires for 1-2 years. We have notice up to 80% improvement in our patients.